The National VET Provider Collection (from which the Students and courses data releases are produced) collects data on VET activity delivered by Australian training providers, to a nationally agreed standard. 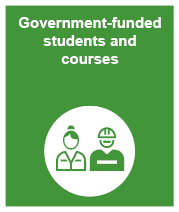 It provides information on the number of training providers, students, program enrolments, subject enrolments, hours of delivery, program completions and source of funding. The collection, which dates back to 1994, has historically reported on government-funded VET, which is broadly defined as Commonwealth and state/territory government-funded training delivered by TAFE institutes and other government providers, community education and other registered providers. This is collected and reported quarterly. In 2014, the scope of the collection was expanded to include total VET activity (TVA). 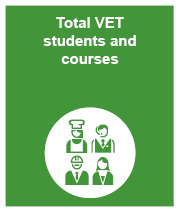 TVA refers to all domestic and overseas VET activity delivered by all types of Australian training providers and reports on students who undertook government-subsidised training and those who undertook training on a fee-for-service basis. This is collected and reported annually. Data are collected either directly from registered training organisations or via state training authorities. All data are validated and submitted to NCVER using the online AVETMISS validation software. From 2016, data submitted to the National VET Provider Collection has also been used for individual student unique student identifier (USI) transcripts.